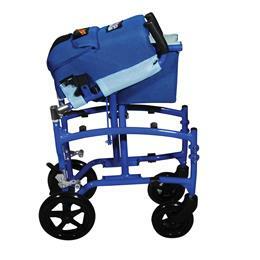 This lightweight, aluminum, portable Transport Chair by Drive Medical is designed to conveniently folds for travel and storage. 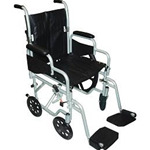 The padded, flip back arms can be removed, the back folds forward and it comes with a two way back release which allows this chair to fold easily. 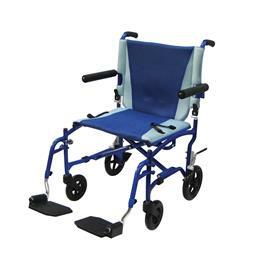 The frame magnets keep the footrests secure against the frame to prevent swinging open when the chair is carried, ensuring users convenience and safety. 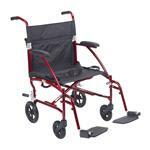 The upholstery is comfortable, lightweight and easy to clean and the aluminum frame is lightweight and strong. 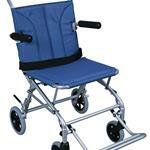 This chair weighs only 14.5 lbs.